Can a Christian have a spell or curse put on them? 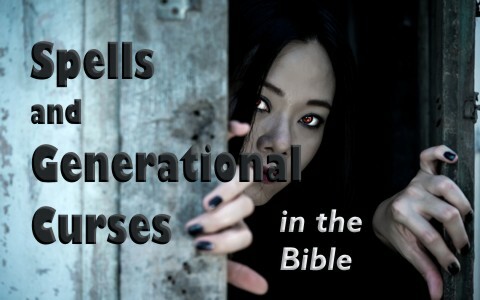 Can families be under a generational curse? The Old Testament mentions that whoever is hanged on a tree is cursed and comes from Deuteronomy 21:22-23 which says, “And if a man has committed a crime punishable by death and he is put to death, and you hang him on a tree, his body shall not remain all night on the tree, but you shall bury him the same day, for a hanged man is cursed by God. You shall not defile your land that the Lord your God is giving you for an inheritance.” Apparently some could be stoned for their sins (Deut 21:18-21), while others were hanged. Both are “punishable by death” sentences but why one is hanged on a tree while another is stoned is not entirely clear. Verse 21 says that the land can be defiled if the bodies are not taken down and buried on the same day. That’s exactly what happened to Jesus. He died on the same day of His crucifixion, hanging as it were, on a tree (a wooden cross), and was buried on that same day, so what was done to Jesus’ body after death was part of the Old Testament law, and I think a law that shows God’s mercy in removing the body and burying it and not making it a public spectacle (knowing human nature). Jesus cursed a fig tree once, and later, “Peter remembered and said to him, ‘Rabbi, look! The fig tree that you cursed has withered’” (Mark 11:21), so God can curse Whom He wants to curse, although they bring about their own curse by rejecting the Lord Jesus Christ, and whoever does not believe in Him will be ultimately cursed for eternity (Rev 20:12-15; 21:8), so what do we do about the curse of being born into sin? There is real hope for those who believe. I cannot even tell you the number of times that people have asked for prayer because they feel they are under a generational curse. Some even claim they’re under an “ancestral curse” where their ancestors sinned grievously and they feel that their family is cursed because of it. They might base their belief on the Old Testament Scripture where it was written, “I the Lord your God am a jealous God, visiting the iniquity of the fathers on the children to the third and the fourth generation of those who hate me” (Ex 20:5), but what they miss are usually two things. This was written to Israel who God brought out of Egyptian slavery (Ex 20:2), so “the Lord said to Moses, ‘Thus you shall say to the people of Israel’” (Ex 20:22), so we must look at the context and the audience to whom this was written. Another point is God visits “the iniquity of the fathers on the children to the third and the fourth generation of those who hate me” (Ex 20:5b), so God is visiting each generation for their own iniquity, which are all “those who hate” God, but these people don’t sound like believers to me because Christians are not God-haters. They love God, although God loved them first (1st John 4:9). What I can tell those who feel they are under a generation or ancestral curse is what the Bible says: “The son shall not suffer for the iniquity of the father, nor the father suffer for the iniquity of the son. The righteousness of the righteous shall be upon himself, and the wickedness of the wicked shall be upon himself” (Ezk 18:20), so each generation, is responsible for their own wickedness, just as every individual is. A generation that is under a curse has brought it upon themselves, but of course, their parents could have contributed to that significantly, but God will hold them responsible for that. That’s not our problem. What I can tell them, as I mentioned earlier, the Bible says, “The son shall not suffer for the iniquity of the father, nor the father suffer for the iniquity of the son. The righteousness of the righteous shall be upon himself, and the wickedness of the wicked shall be upon himself” (Ezk 18:20), so regardless of what their parents did, the children and grandchildren are not going to suffer God’s wrath for something they didn’t do. They might suffer consequences of the parents actions, neglect, etc., but not for their parents’ sin (2nd Cor 5:10). The Apostle Paul is clear in writing, “we will all stand before the judgment seat of God” (Rom 14:10), and we’re not allowed to go get our parents. They will have their own independent judgment. Everyone will reap what they sow. Others have worried needlessly over someone who put a curse on them, and these are not figments of their imaginations. These are real, practicing witches, warlocks, voodoo priests, and so on, who have placed a “curse” or “spell” upon the person or their family, but do these spells have real power? Can a Christian be put under a spell? I don’t think so because the Holy Spirit will not allow another power of the Evil One to possess a person (1st John 4:4), although they might be spiritually attacked (Eph 6:12), but the child of God has overcome the world, and not overcome by it (1st John 5:4). “Christ redeemed us from the curse of the law by becoming a curse for us—for it is written, “Cursed is everyone who is hanged on a tree” (Gal 3:13), so by taking the curse for us on the cross, we who believe don’t have to take it ourselves (which we were all utterly due!). We live in an age when paganism is exploding and the numbers of people who practice shamanism, witchcraft, Satanism, humanism, and other man made concepts is beyond counting. The Christian must hold firm to what the Bible says and we must realize that the end of all these things is sure and certain and will come swiftly (Rev 1:7, 21:8), so if anyone is worried about being under a curse or put under a spell, tell them that unless God brings them to repentance and they put their trust in Christ, they are under a greater curse than any human could ever produce. The eternal separation of God is the worst of all curses, because like the Rich Man and Lazarus, the gap between them and God is unbridgeable (Luke 16:26). Today, if you are not saved, it is the best of days to confess your sins and place your trust in the Savior (2nd Cor 6:2). Just as hell will be the greatest curse ever, so heaven will be the greatest blessing ever…and what greater blessing than to be in the presence of the Lord Jesus Christ, and fall on our faces before Him? More to learn here: What is a Pagan? You actually make it seem so easy along with your presentation however I in finding this topic to be really something that I think I would never understand. I’m having a look ahead on your next publish, I’ll attempt to get the cling of it! Previous post: Is Behavioral Therapy Biblical? Next post: Are Christians No Longer Sinners?